It is increasingly clear that farmers, working families, public health, and the environment are all at risk under the current NAFTA-like trade agreements being pushed by corporate lobbyist and Big Ag. And since most of us want more safe and secure job options, market access for small-scale farmers, and safer and healthier food, these same corporations and their representatives know that the only way to push through more “free trade” policies is to first enact Fast Track. Fast Track would halt further democratic debate and decision-making about free trade. That is why we must act now to stop Fast Track. We’ve done it before and we need to do it again. November 8-14th has been identified as the Fast Track Week of Action. Find or plan an action near you. International Food Workers Week is November 23-29th. This is a time to recognize and celebrate the 20 million workers in the food system, many of whom work long hours for low pay in dangerous conditions. Here is something you can do today. 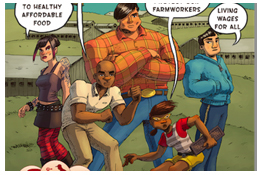 Food Chain Workers Alliance is releasing a comic book called Food Chain Avengers that tells the stories of food workers in different sectors of the industry. But they need our help raising money to distribute it. When you support their Indiegogo campaign, you can choose your level of support and secure your own copy of the book, an International Food Workers Week poster, or other rewards while ensuring that the stories of food workers are heard. Support the effort to launch Food Chain Avengers today! Another way to prepare for International Food Workers Week is to stock up on coffee now. Last month we asked you to show support for small-scale farmers by purchasing our Small Producer Symbol Fair Americas coffee. We hope you enjoyed it. This month we invite you to try our Fair Africa coffee. Proceeds, as always, from this coffee go to support our work with Food Chain Workers Alliance. Order now and serve it up to friends and guests during International Food Workers Week. 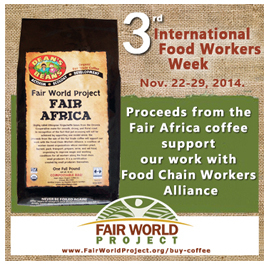 Buy Fair Africa coffee, produced by small-scale farmers, and support Food Chain Workers Alliance. New edition of Brewing Justice: Fair Trade Coffee, Sustainability, and Survival now available. Report exposes violations of indigenous rights, risks to public health, and environmental harm due to Harvard University’s investments in plantations in Argentina. New video from ETC Group explains synbio and exposes risks.